Ok, I admit it… blogging is something I just don’t do enough, probably because images come to me way faster than words. Today’s post features a recent visit to my local library, and as the result of that, a coloring page download to share, with a request*. 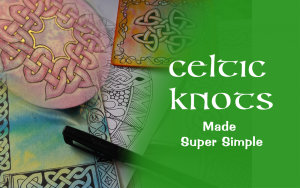 I’ve always been inspired and amazed by the intricate interlacings of Celtic designs and art. Maybe it’s the fiber artist in me. 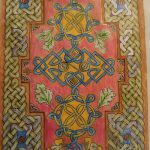 I’ve had the George Bain Classic, “Celtic Art, the methods of construction” for over 30 years, from back in the days when I dabbled with calligraphy. While it’s great for inspiration, the book was hard for me to grasp. 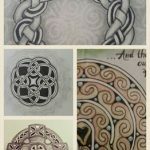 A number of years ago, (before Zentangle) I took a short afternoon class on Celtic drawing and came away frustrated but wanting more. And so began a long dance with teaching myself, from many varied sources. I’ve come to discover there are many ways to approach drawing these, and if one way doesn’t resonate, it’s worthwhile trying another. The local Celtic Evening Prayer services at Immanuel Retreat Center in Bellows Falls and my pilgrimage visit overseas have only served to inspire me to delve deeper into this form of contemplative art. 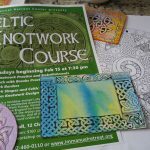 And so I was led me to have a long conversation with Beau, the director (and fellow lover of things Celtic) of Stone Church Arts / Immanuel Retreat, where I’ve been offering Zentangle and Labyrinth workshops, and we decided to offer a Celtic Design workshop and course to the community in February and March of this year. Last week, while deep in teaching prepwork, I found myself at my local library and saw a beautiful HUGE community colored mandala on one of the tables. 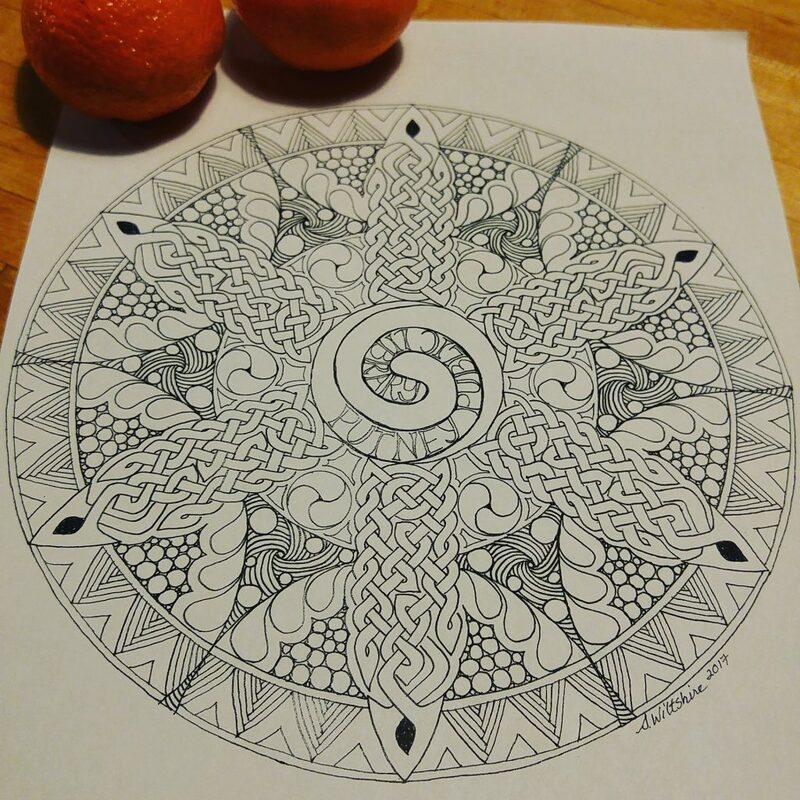 The director saw me looking at it and asked if there was a way to download or find mandala art to color that was of a higher resolution, which inspired me to draw an original piece that they could scan at any resolution. 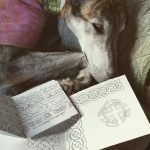 Up to then, all of the artwork I’d created had either been sketchbook work, a couple of Celtic style “carpet pages” (ala Book of Kells / Lindisfarne Gospels), some labyrinth art journal pages and small canvases and cards. After delivering the artwork to the Putney Public Library and sharing a photo on Facebook, a number of folks asked if I could share the piece as a coloring page. And I’m happy to do so, but with a request. Please do something to SUPPORT your local public library, (or mine! ), a donation, or volunteer, etc…..
Lastly, I’d love to see what you do with it! 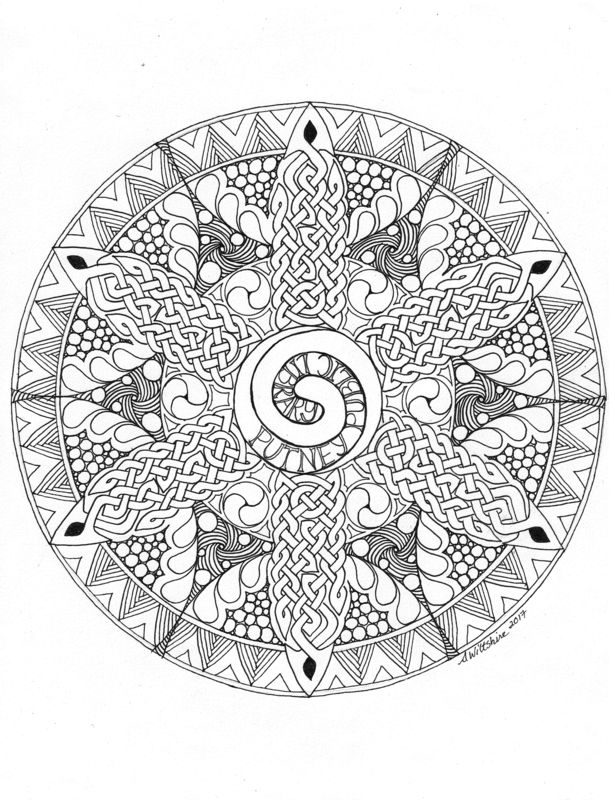 This entry was posted in Art Workshops, Community, Mandalas, News. Bookmark the permalink. I would like to know more about your online courses. I just have gone through the 3 on skill share and enjoyed them very much. I watched and took notes twice but am beginning to see. How expensive are your online courses and do I need special software to follow it? 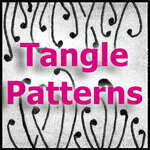 I am just beginning to dapple in lettering and zentangles and have always been memorized by Celtic Knots. Actually both my husband and I – he would like to know how to tie them. I am just taken with drawing the designs. I only have skill share till Mar 1 and cant really afford it after that. Hi Linda! Thank you so much for taking my Skillshare classes! I’m so glad you’re enjoying them! Actually yes, I also have a self-paced Zentangle-Inspired Art Journaling class called “The Tangled Sanctuary” that also includes a bonus beginning Zentangle class, as well as lessons to create a beautiful watercolor background and tangled journal page or card, with examples of adding color for shading and using white for embellishments and highlights. No experience required! 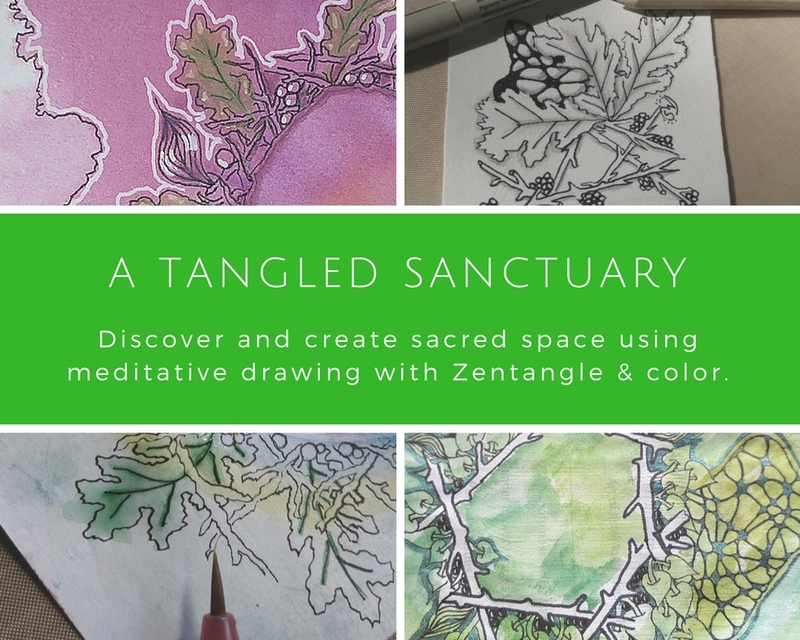 The Tangled Sanctuary course is $39. I also have a lesson in the self-paced Black and White Journal Course with many lessons from 8 different teachers plus 2 book/journal structures to learn. That’s also a fun class, and can be found here for $60. cheers and thanks so much again!